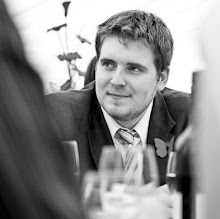 Apologies for the lack of recent posts! Life has been pretty busy recently. However, I shall kick off the new month with a couple of April Fool Adverts that were featured in today's Metro. It has become somewhat of a tradition for BMW to describe a new "innovation" to their vehicles that sound too-good-to-be-true. This is because they are. I remember last year, the "innovation" was an electrified hub-cap that would shock any passing dogs that decided to urinate against their cars. The idea was that the shock would train the dog not to urinate against cars, and stop the hub-caps from rusting! A nice idea, but ridiculous in reality. 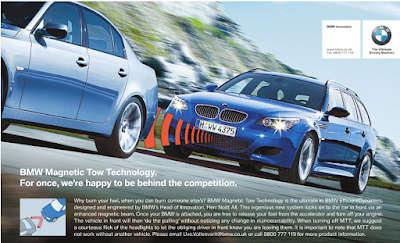 This years "innovation" is the "BMW Magnetic Tow Technology". The principle concept is to have your car magnetically attach itself to the car in front. You could then turn off your engine and allow the car in front to simply tow you along. Personally, I think they went a tad too grand scale with the idea for it to be believable. It is much easier to fall for the small little additions to a vehicle than something that will change the way cars work forever. Despite this, it is still a nice effort from the BMW guys, and the final touch of adding a contact email address (Uve.Vollenvorit@bmw.co.uk) is pure genius. Someone should send that to Terry Wogan. I was among the saps that fell for this April Fool's joke from BMW. It got me thinking about Magnetic levitation.